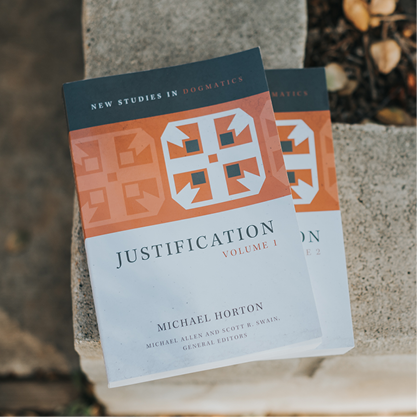 Dr. Horton's latest publication is a two-volume set called Justification and is part of the New Studies in Dogmatics series. This set is available for purchase online. Volume 1 engages in a descriptive task - an exercise in historical theology exploring the doctrine of justification from the patristic era to the Reformation. Broadening the scope, Horton explores patristic discussions of justification under the rubric of the "great exchange." He provides a map for contemporary discussions of justification, identifying and engaging his principal interlocutors: Origen, Chrysostom, Augustine, Thomas Aquinas, John Duns Scotus, William of Ockham, Gabriel Biel, and the magisterial reformers. Observing the assimilation of justification to the doctrine of penance in medieval theology, especially via Peter Lombard, the work studies the transformations of the doctrine through Aquinas, Scotus and the nominalists leading up to the era of the Reformation and the Council of Trent. He concludes his first study by examining the hermeneutical and theological significance of the Reformers’ understanding of the law and the gospel and the resultant covenantal scheme that became formative in Reformed theology. This then opens the door to the constructive task of volume 2 - to investigate the biblical doctrine of justification in light of contemporary exegesis. Here Horton takes up the topic of justification from biblical-theological, exegetical, and systematic-theological vantage points, engaging significantly with contemporary debates in biblical, especially Pauline, scholarship. Horton shows that the doctrine of justification finds its most ecumenically-significant starting point and proper habitat in union with Christ, where the greatest consensus, past and present, is to be found among Orthodox, Roman Catholic, and Protestant theologies. At the same time, he proposes that the union with Christ motif achieves its clearest and most consistent articulation in forensic justification. The final chapter locates justification within the broader framework of union with Christ.